Sci-fi, comics, humor, photos…it's all fair game. 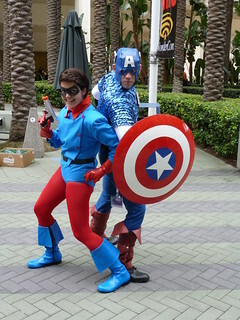 WonderCon’s first year in Anaheim* was a lot of fun despite the rain and wind. 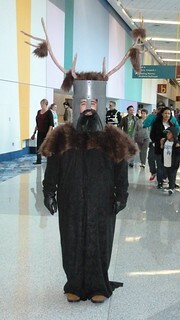 I actually enjoyed it more than the last one I attended in San Francisco (WonderCon 2010). 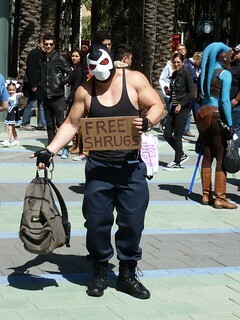 Partly that’s because a lousy trip into SF soured my mood, and partly it’s because I spent all three days at the con this year, but it’s also because this year’s con had everything I’ve come to expect at a WonderCon, with more space, so the crowds never got unbearable. »Skip to the photos if you’re so inclined. There was a very strong comic book focus to the con, maybe not so much as at Long Beach, but all the major comics publishers were there, plus many of the minor ones. I was surprised to find webcomics wrapped around the large-press area and not hidden off in a corner. The small press and Artist’s Alley areas were huge (especially when compared to Wizard’s Comic Con in the same hall two years ago). And there were comic book dealers all over the place. The only real complaint I had about the layout was that it seemed a bit haphazard. Marvel, IDW, and DC were front and center, but Studio Foglio and the Winner Twins were stuck in between IDW and DC. Zenescape was off in a corner rather than being clustered with fellow indies Archaia, Aspen and Avatar. And when I say the comic dealers were all over the place, I mean scattered all over the place. 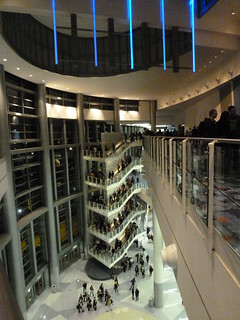 The rest of the convention center was being used by a girls’ volleyball tournament and a cheerleading competition. I was encouraged by the fact that the players were just as interested as the fans in taking photos of and with the people in costumes, from Captain America and Bucky through Optimus Prime. *They’d like to return to San Francisco after Moscone Center’s renovations are done, but that’s still up in the air. Friday I went solo. It was lightly attended but still busy, and if anything, I’d call it relaxing. I spent a lot of time in panels, exploring the floor, and looking for bargains and cool stuff. 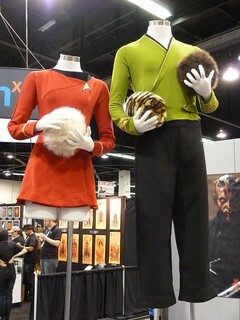 This was probably the most traditionally “comic con” day for me. I parked in the convention center lot before noon and stayed until 9 at night (for Superman vs. the Elite), and still felt energized when I got home. It reminded me of the last time I did a Friday at WonderCon (2009) in San Francisco, or like a day at SDCC back in the 1990s. Katie and I both went to the con on Saturday, when it was a lot more crowded. We parked in the lot across the street, got drenched on the walk to the convention center, and got hailed on that evening. I went to a couple of more literary panels, but didn’t spend much time on comic events…though I did spend a lot of time hunting down autographs. After Friday’s dismal plastic food (worst. pizza. ever.) in the convention center, we made a point of taking a break for lunch and eating at one of the hotel restaurants. That was definitely worth it. Sunday was very different, because we brought our son along. Having a toddler with you really changes what you can do, how quickly you can get around, etc. (We also got in later, which meant parking waaay out at Angel Stadium and taking a shuttle in. Fortunately the shuttles were fast and frequent.) Crowd weaving with a stroller is a lot more difficult even than crowd weaving with a giant backpack. We were only there for about four hours, and mostly spent the time exploring. I don’t think he really understood what was going on, but he had a good time people-watching, and playing with demo toys, and I made sure to find him a place out of the way that he could run around. After a couple of years on hold, I’ve picked up the Comic Book Tattoo autograph project again. Only Ted McKeever was there out of the artists and writers I still needed, but since I wan’t carrying a computer around, I figured I’d bring it on the first day. Then I picked up a volume of Absolute Sandman for 50% off. (How do half-price trade/hardcover booths make a profit? Is it a loss leader? Clearance?) I was very happy that I’d managed to park in the convention center lot that day. I talked for a while with Randy Milholland of Something*Positive, and while I wasn’t planning on buying any original art, I figured I’d take a look, and stumbled upon a piece that inspired a running gag here. Then he told me the real story of the childhood event that inspired the storyline. Somewhere in here, the real T-Bob showed up, and he and Randy caught up while I continued looking through the art. I got Naomi Novik to sign the latest Temeraire novel, Crucible of Gold and Ernest Cline to sign the audiobook of Ready Player One. (I’d read the book on the Kindle, and discovered that morning that Wil Wheaton reads the audio version. Apparently they’d been trading recommendations for quite some time, informally, and Wil was quite pleased to get to do the audio version. He didn’t pre-read the book, so he didn’t know he was in it until about the page before, and still managed to read it “like a boss.”) Humberto Ramos signed my copy of Impulse #1 (previously signed by Mark Waid), and I caught up with Fiona Staples for Saga, and Joe Benitez for Lady Mechanika. 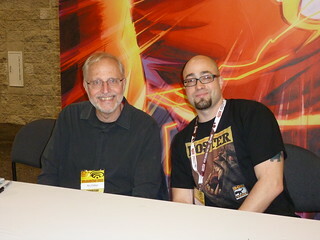 I talked briefly with Flash co-writer/artist Brian Buccellato, and intended to head back to his Artist’s Alley table later, but somehow never quite made it. 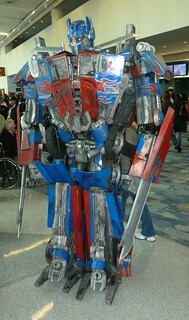 Programming is one of Comic-Con/WonderCon’s strong points, and they always have a wide variety of events. As much as people complain about the Hollywood presence in San Diego, most years you can put together a personal schedule of entirely comic-book events that barely leaves you any time on the floor (or for lunch). I caught the Superman vs. the Elite screening on Friday. Since it was Friday, I had no trouble getting in, and getting a really nice view of the second row of screens. It moves the premise from Action Comics #775 to a more political stage, and while there are problematic elements, and the animation style takes getting used to, my favorite part of the movie was the interplay between Lois and Clark. In general, I’ve found that if I have to choose between an announcement and a discussion, I’ll go for the discussion. (The announcements will be online by the end of the hour anyway.) I did check out the Hobbit panel, which turned out to be less preview and more “What we know so far…” from The One Ring.net, and the Friday DC Comics & Vertigo panels. I got some good quotes, but not much information out of the DC panel, while Vertigo has me seriously considering checking out American Vampire. A couple of audience surveys at the DC panel: Only about 1/5 of the audience raised its hands when asked whether they read comics online. And it was sad that only a handful recognized China Miéville’s name. Anthony Bourdain’s upcoming graphic novel Get Jiro sounds like one of those amazingly bizarre books that will either be awesome or awful: In a dystopian future Los Angeles, the divide between haves and have-nots has become extremely sharp. All forms of entertainment have died out except for food, and the action-adventure focuses on Jiro, a sushi chef caught between literally-warring gangs of foodies. More fun were the Saturday panels on Rewriting History and the Science Behind Science-Fiction. Rewriting History featured Naomi Novik (Temeraire), Ernest Cline (Ready Player One), Rob Reid (co-founder of Rhapsody, with a sci-fi novel coming out called Year Zero) and — when he finally made it through the parking mess — Todd McCaffrey (the more recent Dragonriders of Pern novels). One of them told us about the time he was almost bitten by a radioactive spider, and how just for a moment, he actually considered letting it bite him. 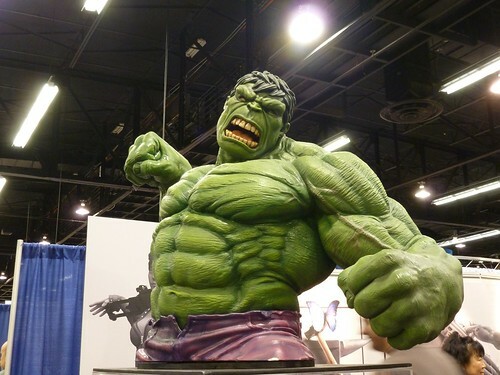 This entry was posted in Comics, Conventions, Photos, Travel and tagged Anaheim, Long, WonderCon, WonderCon 2012 on March 21, 2012 by Kelson. 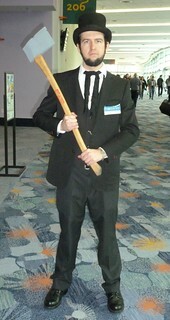 Good comments and article; but I still want Wondercon back in San Francisco, perhaps in two Moscone buildings! A California couple into sci-fi, the Internet, and the strangeness of the world.